…the Easter Bunny came to my OFFICE!!! 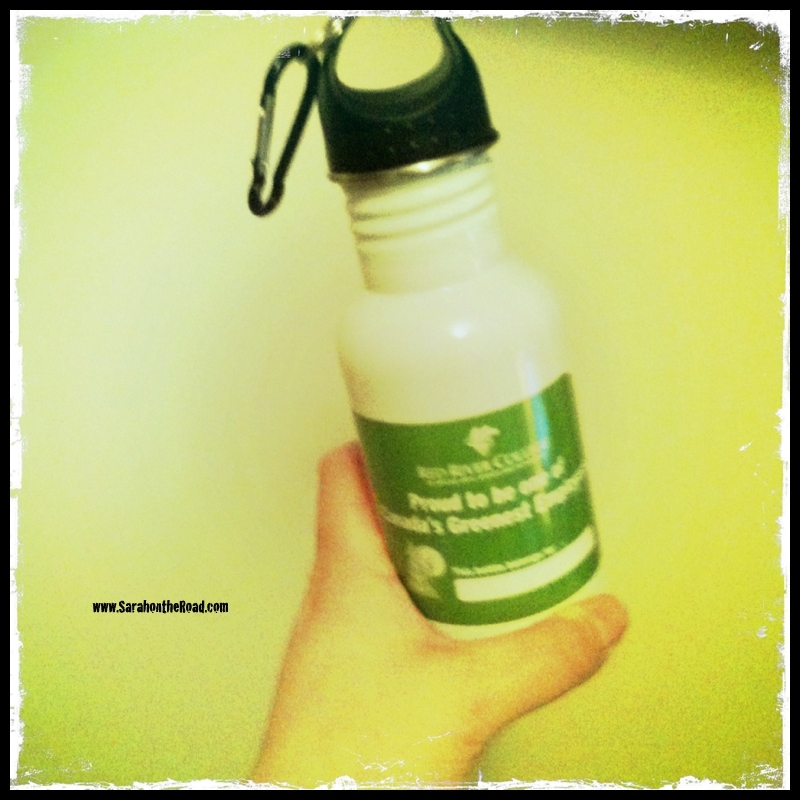 …and left this nifty Water Bottle! Ok, so it wasn’t the EASTER BUNNY after all…. 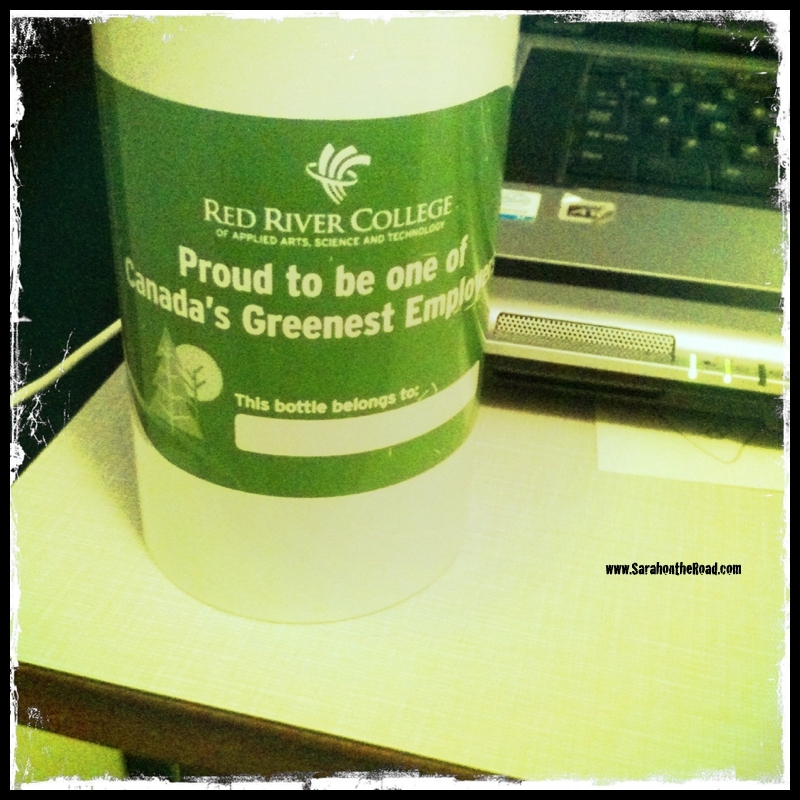 In an email from RRC’s president explained what all the excitement was about…and WHY we all got water bottles! “We’ve received this prestigious honour thanks to our efforts to reduce the environmental impact of College operations, incorporate sustainability into our research and academic programming, and engage staff and students in more eco-conscious behaviour. Launched in 2007, the Canada’s Greenest Employers competition is organized by the editors of the Canada’s Top 100 Employers project. This special designation recognizes employers that lead the nation in creating a culture of environmental awareness in their organizations. These employers have developed exceptional earth-friendly initiatives — and are attracting people to their organizations because of their environmental leadership. I must admit it is really neat to be employed in a place that is so environmentally aware! Keep up all your hard work! This entry was posted in Fun with Work Mates, Life in Manitoba and tagged Easter on April 27, 2011 by Sarah on the Road. Normally people collect “air miles” or “aeroplan” points to try to get enough for a flight to take them away somewhere on vacation… honestly, this was my intention too…but then something else happened!!! But first let me backtrack a bit…. 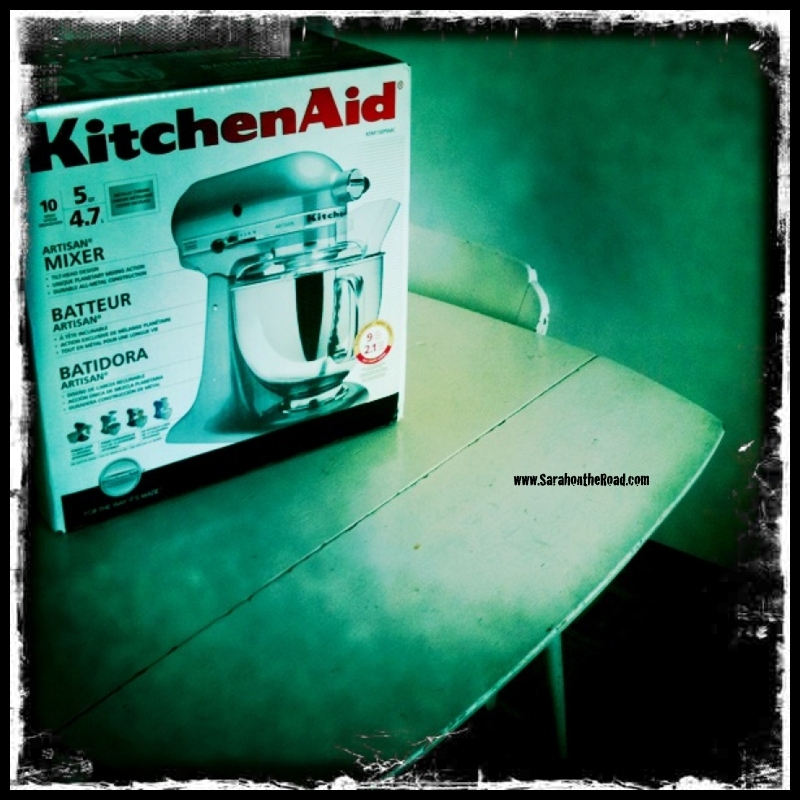 I remember the first time I used a ‘kitchen aid’ mixer. 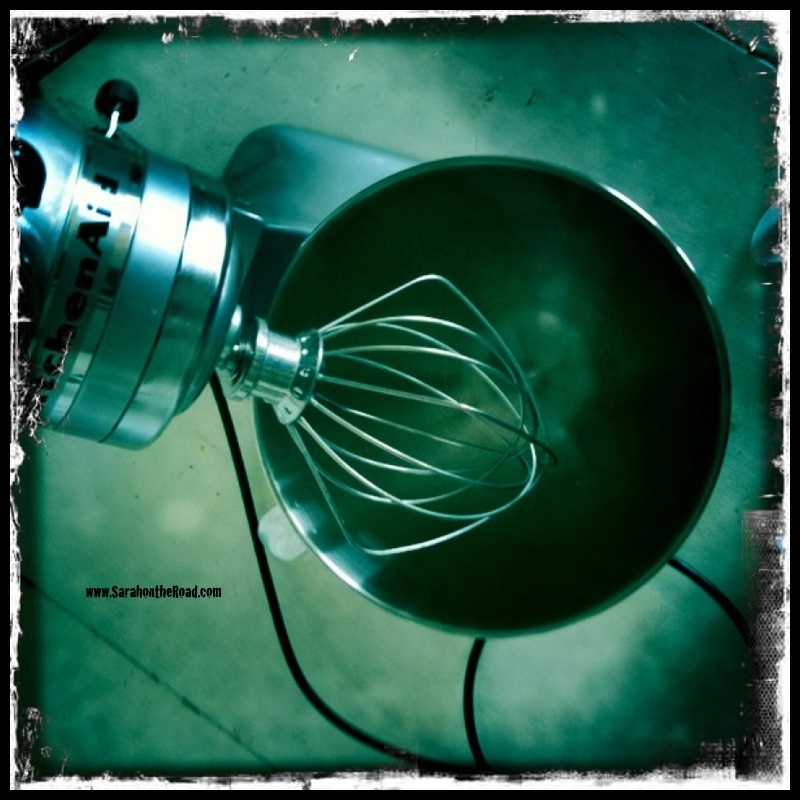 I was 20 and doing a nanny gig in the spring time… and used one to make cookies with the kids… and I knew that I wanted one from that very day, then I realized how they were a bit out of my then student budget! I had to wait 8 days… and then I came home and sitting in my apartment was THIS box. *my super decided to let in the UPS guy, and put the package in my apartment..so I didn’t have to be here to receive it–funny thing is one day later my supers stopped doing this for people! …still need to break it in, and perhaps come up with a name? But then again, not ALL things I own have to have a name… just my car so far–if anyone is keeping track! 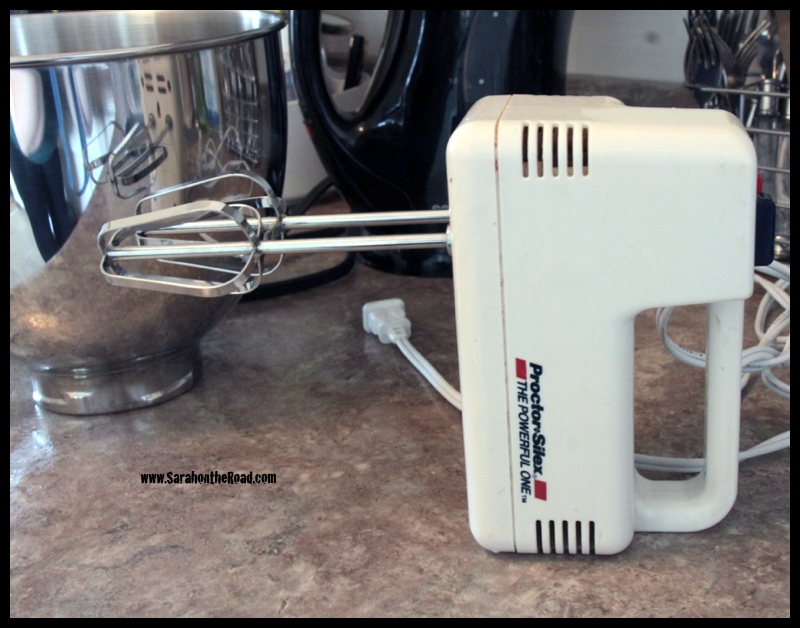 I had to move aside my old mixer, that was a gift from a co-worker when I arrived in the ‘peg…but there’s a mixer in town…. (no hard feelings old guy!) 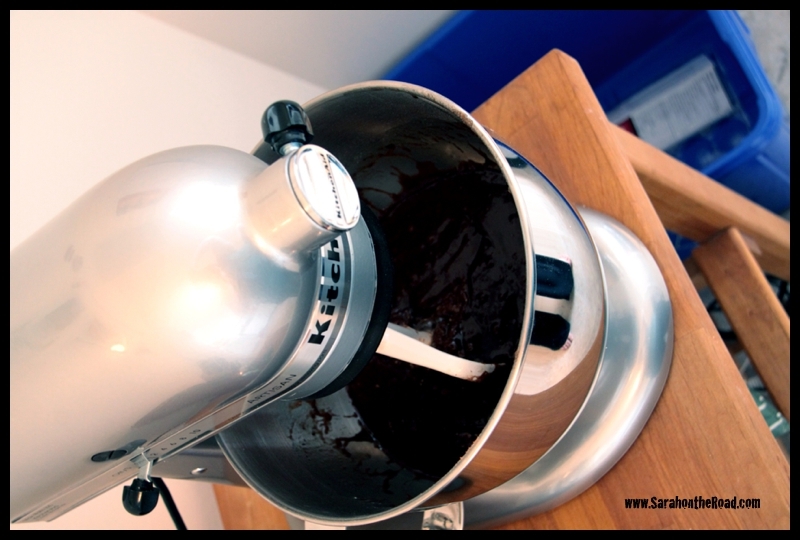 On March 26th I made my first brownies with my new Kitchen Aid!!! 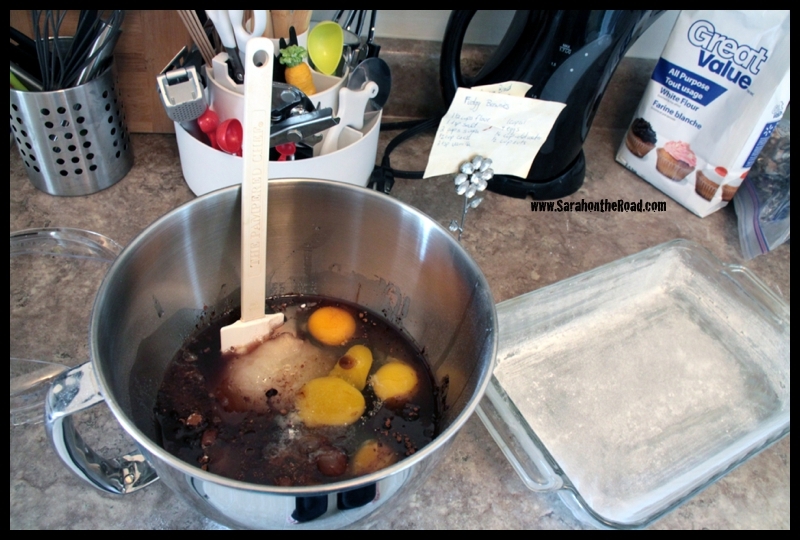 I quickly added all the ingredients for my famous fudgey brownies–been making them since elementary school! Oh… look at the mixing… in like 2 mins it was DONE! All in all.. 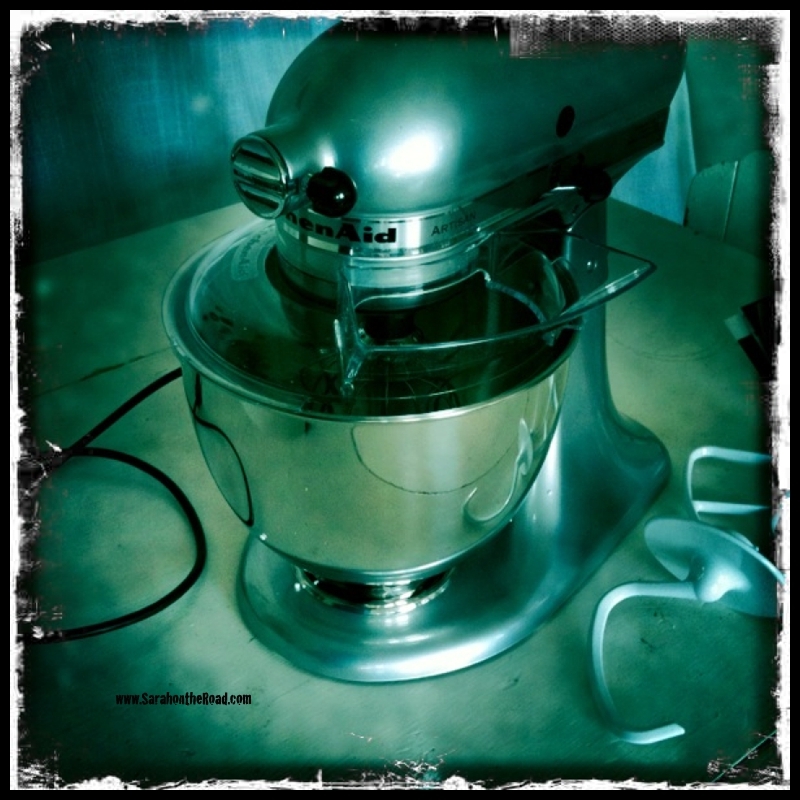 I was a VERY happy with my new mixer… I can’t wait to explore and do other things, like make bread dough… and gingerbread cookies at Christmas… so many possibilities!!! 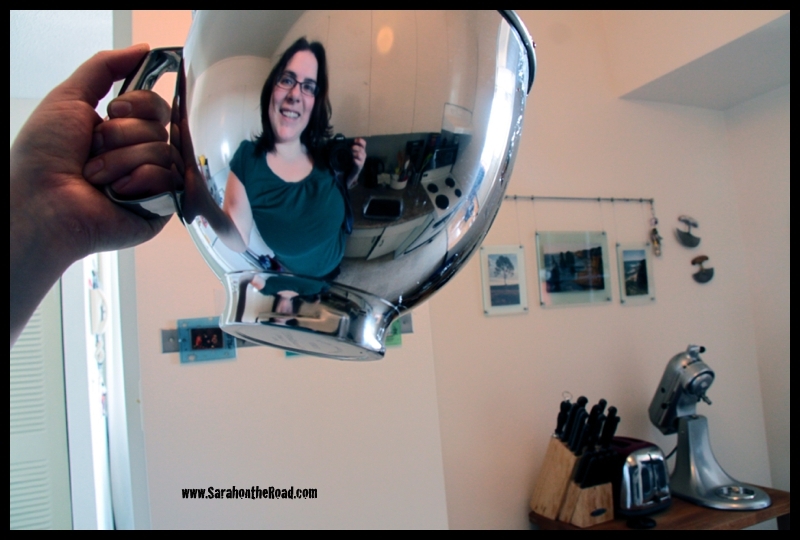 This entry was posted in Life in Manitoba on April 26, 2011 by Sarah on the Road. …who you might run into when you are at the Forks! 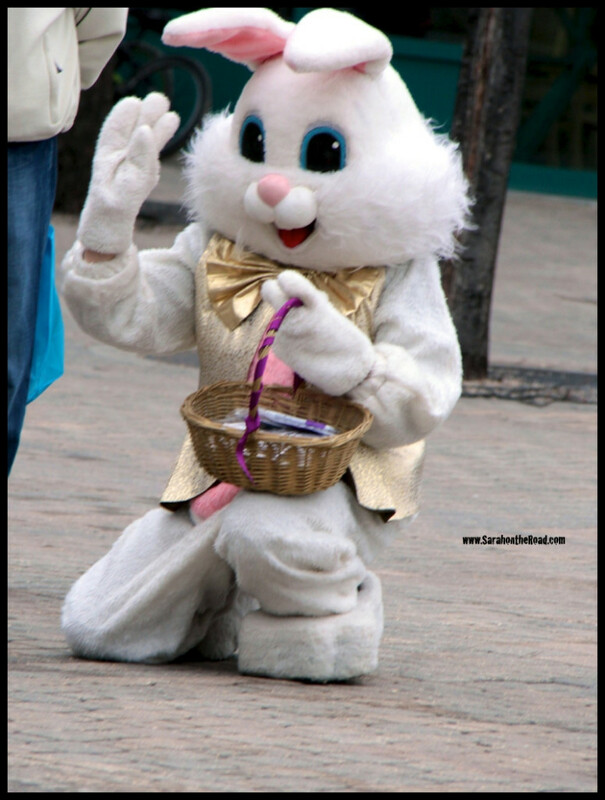 I know.. who could resist the ‘creeper’ in the white bunny suit? I certainly couldn’t…after he waved to me…. I had to get a photo..and I got given DARK chocolate! Hope all my friends and family had a fantastic Easter weekend, and the bunny found you as well! 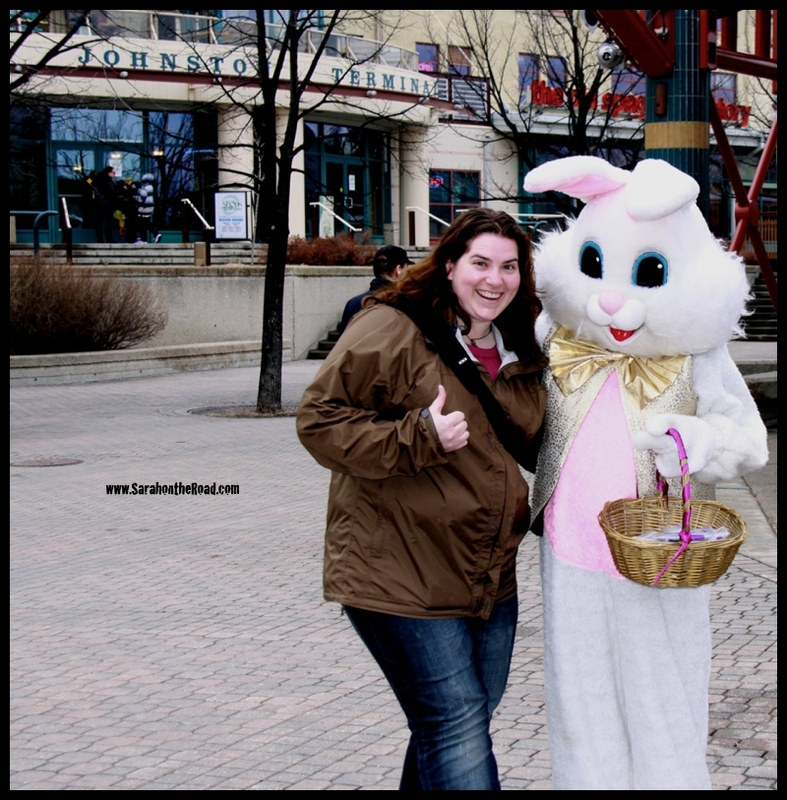 This entry was posted in Holidays, Life in Manitoba and tagged Easter on April 26, 2011 by Sarah on the Road. Yes, I still remember you… and I’m sorry we haven’t been spending much quality time together lately. April has been a very busy month. I was sick, really sick for the first 2 weeks of the month–which kind of put a downer on my blogging. I had a quick whirl wind weekend tour to visit friends and family in Ontario… and then this Easter Long weekend–where I have spent the days recharging my batteries, and starting to feel like I have my groove back!!! I also have had a lot going on professionally as well as personally… that I’m sure you will hear all about at some point in time! It’s weird after NOT blogging for so long… it’s kind of hard to get back into the swing of things again. But don’t you worry…I do have some stories to tell, some from the last 8 weeks AND some more recent ones as well.. so stay tuned because they are some good ones! I also have some exciting changes ahead for you blog…as soon as I wrap my head around the ‘technical’ changes… and figure out formatting issues… I’m sure the updates will dazzle any of our readers that we still have and if we don’t have any readers… I totally know that I will be excited, as will my mum and gramma, the two readers I know read this blog faithfully! 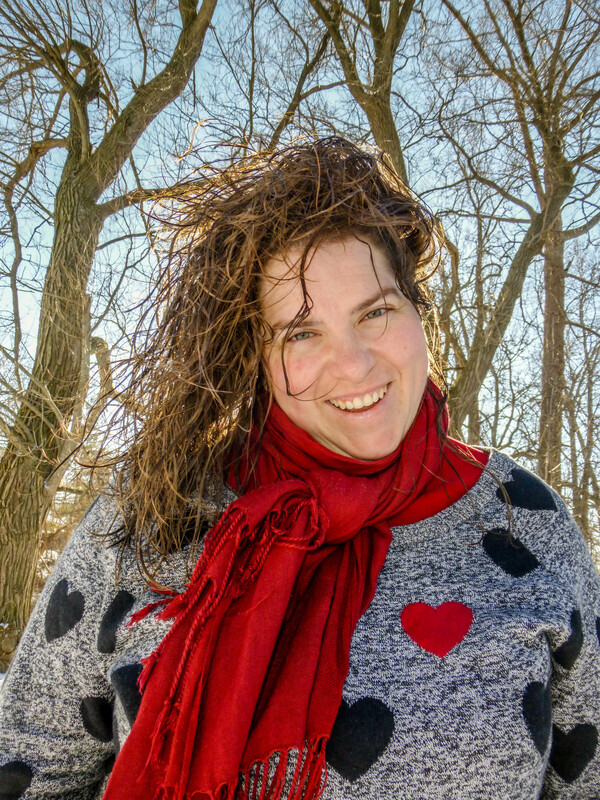 Have no fear, I am back… and I do have stories to tell! This entry was posted in Blogging Community, Life in Manitoba on April 26, 2011 by Sarah on the Road.